By Tom Cryan, Irish Independent, 6th July 1959. 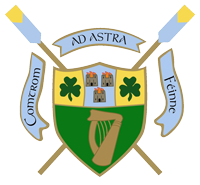 The German oarsmen from the “Germania” Club in Frankfurt, who had swept the boards at the Cork City regatta on Saturday, suffered what can only be regarded as a sensational defeat at Limerick regatta yesterday, when the little-fancied U.C.D. seniors beat them by a canvas. In a finish, that for spine-tingling excitement put the Frankfurt-Garda battle at Cork in the shade, the students showed wonderful grit in holding on to a lead which they built up right from the moment they left the stakeboats. It was the climax to a day of upsets for the Germans, who were confidently expected to take all three senior events, had to be content with but one victory in the first senior fours. Earlier Garda, rowing with all the cohesion for which they are famous, took the second senior fours by two clear lengths from the Germans. In the final analysis, however, nothing compared with the U.C.D. performance in the “eight”. They not only surprised both the Germans and Garda – they fooled them completely. On water which was whipped up by a very strong breeze, they took the bit between the teeth and went after victory right from the “off”. Garda and Frankfurter kept together behind, obviously convinced that the students would crack after the first half mile. But U.C.D., whose only other successes this season were at Athlone and Carlow, where they beat moderate opposition, did not facilitate their opponents. Rather, they kept magnificently well together, and the hard months spent in training on the Liffey paid off at last. It might be as well to mention that, with the water whipping up as it did yesterday, the draw meant a good deal, and in this regard U.C.D. were favoured. On their station they had whatever advantage there was until some 300 yards from the finish where, owing to the curved course, the team on the other side of the river was favoured with relatively calm water for the final effort. The Germans, on the far station, made full use of the calm and were fairly lifting their boat out of the water at the finish, but they had left themselves with just that little too much to do. Garda, who had stuck with Frankfurter early on, had not the same finishing power and were a length behind the visitors at the finish. It must have been a rude shock for the Germans, who had seen U.C.D. fall behind in the race at Cork. Clearly they had decided before the race yesterday that Garda were their only danger, and they rowed accordingly. However, the finishing line came all to fast for them when they decided to get to grips with these surprisingly good U.C.D. oarsmen. Frankfurter did not begrudge U.C.D. their victory. “They rowed extremely well”, said an official, “and surprised us”. The same went for Garda, whose cox, Paddy Hoare, admitted afterwards that he did not expect them to keep it up. It was quite obvious that the conditions did not suit the Germans. Accustomed to comparatively calm, non-tidal water, they were not able to get full power into their strokes, or so it seemed. They used the same boat in which they had won at Cork, a boat loaned by Shandon B.C., in which the slide is two inches shorter than in Continental boats. All the excuses in the world, however, cannot detract from the U.C.D. performance. They did not relish the “heavy going” either, and the fact that the German slide was two inches too short was little consolation to them before the race. They had seen Frankfurter at Cork that this would be only a minor handicap. In both the “Fours” events, the Germans, I gather, experienced a certain amount of difficulty in extricating themselves from the paths of crossing boats, whose coxes found steering hard in the choppy water. It did not matter a great deal in the First Senior Fours, in which Cappoquin gamely pipped Garda for second place. In the second, however, this difficulty, plus a rather bar start which the Germans got, proved insurmountable with Garda rowing so well. 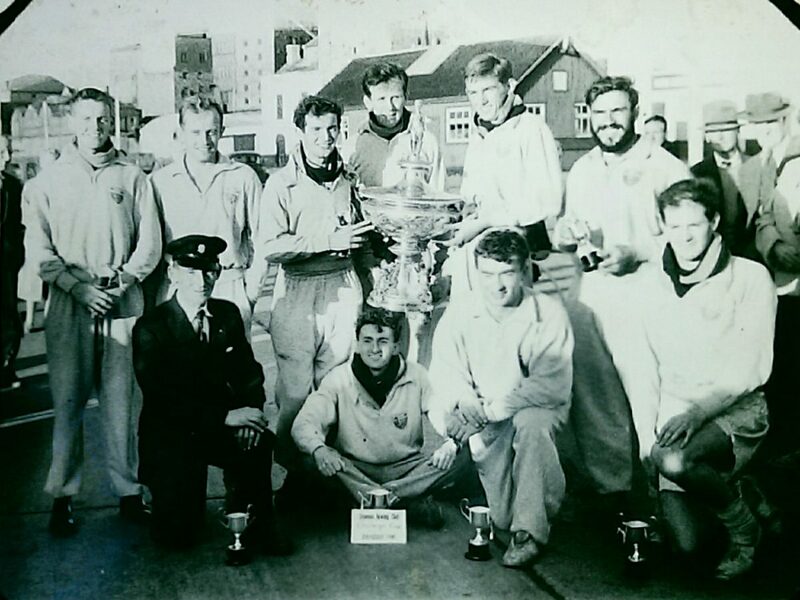 The Garda maiden oarsmen had a trying day, having qualified for the final of both the Fours, with the Eight final due immediately afterwards. In the Eight, they just could not cope with the conditions and were badly beaten by Shannon.